Adhesive + powder, the perfect pair to deliver industrial strength adhesive powers to the worst breaks. Bonds metal, aluminum, PVC, ABS, wood, rubber, glass, stone, ceramics, jewelry, leather and most other commercial plastic materials together and with each other. when used without the powder, the bond will remain optically clear (e.g. glass, Plexiglas,...) and flexible (e.g. tarps, rubber,...). 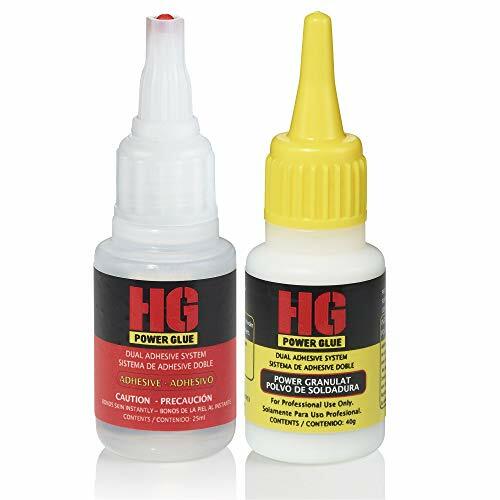 Industrial adhesives by HG Power Glue are very long lasting and durable cyanoacrylate adhesives. The high purity grade and solvent-free manufacturing processes make these adhesives ideal for universal use in a variety of applications. remove any dirt, grease, oil and glue residue from the area of application. We recommend cleaning with the HG- Cleaner. for severe breaks or cracks, use the HG Powder to fill any gaps. then saturate the HG Powder with the HG Power Glue. What follows is a chemical reaction! Caution: The chemical process will generate heat and vapors! Wear appropriate work gloves and safety glasses! Do not inhale the vapors! Properly ventilate the work area! after hardening (between 20-60min depending on the material), the chemical weld can be machined,i.e. by drilling, thread cutting, sanding and painting. superior bond strength - Welding Glue from the bottle is unparalleled in its performance and, due to its unique combination of powder and glue, achieves significantly better bonds than standard glues. Even parts with excessive wear and tear can be repaired to last. save time & money - no more wasting and replacing broken or shattered objects. They can be salvaged quickly at an affordable price. The chemical weld only takes seconds to set and is weatherproof and extremely durable. Resistant to heat and cold (-49°F to +239°F), waterproof and machineable. the ideal glue solution for a host of applications - a crack in the bumper of a vehicle, a broken headlight bracket, torn RV paneling or simply an instant fix for your child's favorite toy. a single system for bonding 93% of all materials - from plastic materials to wood, rubber, glass, metal, aluminum, ceramics, stone etc., this adhesive system forms a tight bond with everything that belongs together. So easy to use it works for everyone. See for yourself - Everyone from hobbyists to mechanics will be 100% satisfied by the ease of use and effectiveness of this user-friendly glue. CONVENIENT STORAGE, 1 ADHESIVE SYSTEM 4 APPLICATION OPTIONS: can be stored in refrigerator/freezer for 1-2 years or longer; use for bonding, strengthening, modelling, filling. Up to 600% more effective than regular adhesives. If you have any questions about this product by HG Power Glue, contact us by completing and submitting the form below. If you are looking for a specif part number, please include it with your message.